I went walking with my dad yesterday. He only phoned me up on Sunday evening to tell me about it. This meant that I had little time to prepare for a very early start. I’d barely slept at all Friday night, and Saturday night likewise, so I’d spent most of Sunday asleep. I felt like I had just fallen asleep by the time my alarm went off at 5:45am on Monday morning. It took me a moment to realise the sound I was hearing was my alarm – I was confused by it, I was confused by the time on my alarm clock. Really? Am I supposed to be awake now? But I dragged myself out of bed anyway, went to shower and get ready. Managed to be late leaving the house anyway, and had to rush to the bus stop. My bus was at 6:50am. By 6:40am I was 15 minutes walk away from the bus station. I ran, walked, ran again. 6:50am on the dot I was there, breathing heavily, feeling slightly feint from the exertion when I hadn’t eaten and hardly slept, but the bus was not. 6:55am, bus still not there. I phoned my dad, panicked. Just as I hung up on my dad the bus came, what a relief. I boarded and arrived into town soon enough. I’d been planning on breakfast at Subway, but it was closed, so I went to Sainsbury’s local, where there were no dairy free options so I was forced to break my diet – I bought pastries, and then I felt guilty so I bought some fruit too. I got to the station and sorted out my tickets then got on the train. Just over an hour later – sometime after 9am- I arrived at Stoke-on-Trent station. I’ve always, always passed through this station to other places, so it was quite weird getting off the train here. My dad met me in the car park and we drove to the Peak District. 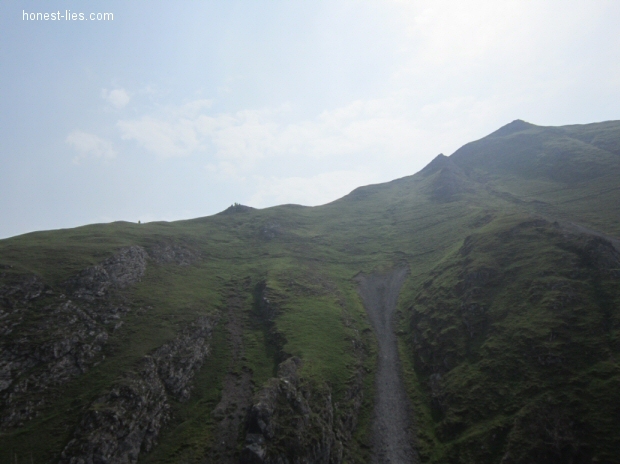 Today my dad had planned a route in the Dovedale Valley. I’d been around this area before with my walking society, but a different area, and on a day with far worse weather than yesterday. We started out from Ilam Hall, walking towards Bunster hill. We ascended Bunster Hill, passing many lambs with their mothers watching us warily. In the distance a farmer was herding up his sheep, whilst his sheep dog sat on the back of his tractor and watched. All these sheep were making a right racket, but otherwise it was peaceful. The weather was clear and warm, I’d brought my fleece, hat and gloves and wrapped up in many layers, but soon I was down to my tshirt. The ascent was a long slog, as all ascents are, but as we got higher a nice cool breeze picked up which was very welcome. 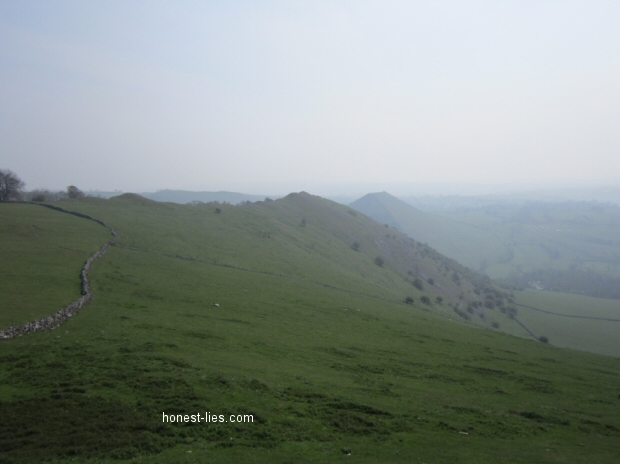 The views were also beautiful – with the fields, and Ilam in the distance. 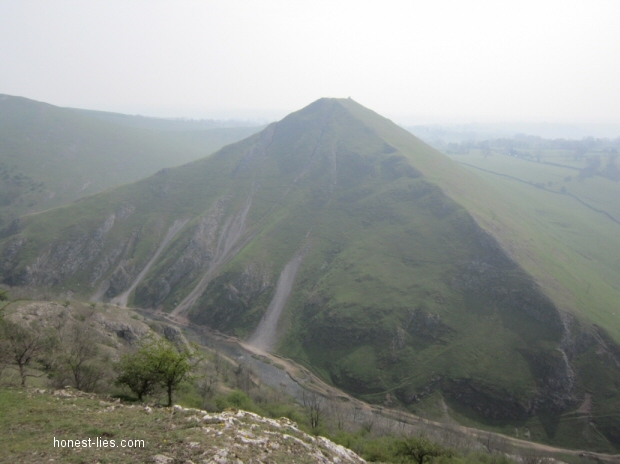 As we walked along Bunster hill the view opened up so we could also see Thorpe Cloud on the other side of the hill we were on and Dovedale valley with the River Dove nestled in between. 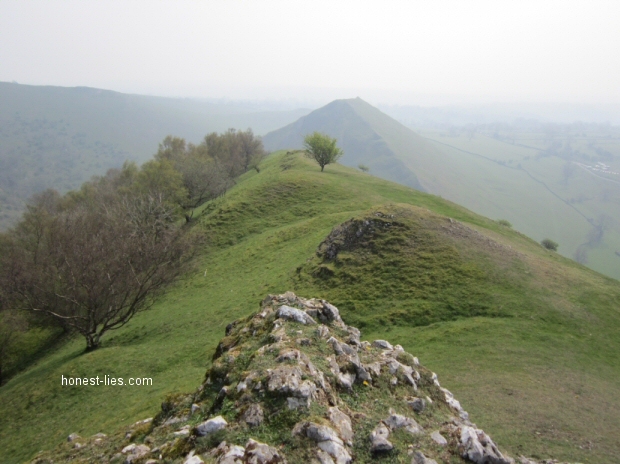 The shapes of other walkers were everywhere – Thorpe Cloud and the path alongside the River Dove were teeming with walkers, all of which we could see from above. We sat down to eat a snack – more pastries – then carried on. 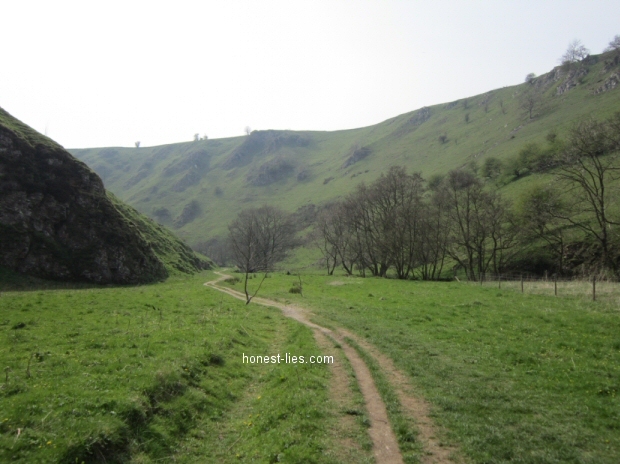 We’d been planning to go back on ourselves to take a certain route down to Dovedale valley, instead we carried on to the end of Bunster hill in the direction of Thorpe Cloud. Once there we were faced with a tricky descent down to the valley – it was steep, and the ground was dry with many loose stones. My father held my hand most of the way down, supporting me every time I stumbled, whereas when he stumbled I tensed and had a moment of panic because he would only pull me down if he fell. We picked our way down successfully and then joined the crowds walking along the river. At a certain point on the path you have to cross the river along a set of stepping stones before the path resumes – here is where our path, and the path from Thorpe Cloud meet. There were so many people that there was actually a queue to use the stepping stones. They should build two different stepping stones for the different directions of traffic, my father joked. and another smaller one for the dogs, I followed. Eventually it was our turn and I held my fathers hand in both of my own, as the way the water swirled around the rocks was disorientating and I didn’t want to fall in – the water looked clear but in reality it is possibly diseased due to the presence of the sheep. 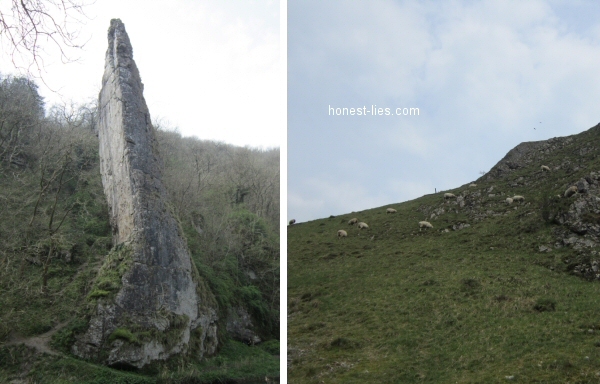 Once across we carried along the river basically – up to lovers leap and down, then following the river past Ilam rock and all the way to Milldale, and further on towards Wolfscote Dale. 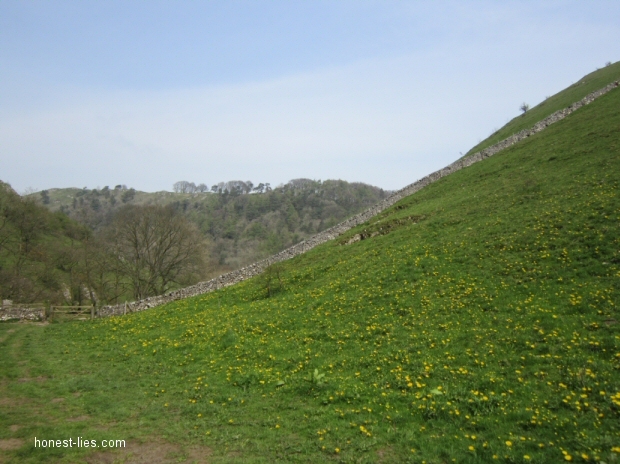 By the time we reached Fishpond Bank, just before Wolfscote Dale or within it I’m not certain, the crowds had died down – most had parked off at lovers leap, or Milldale. The Fishpond Bank valley was very quiet. A man in the distance, fishing. A couple lounging by the river bank. Otherwise just us. The green fields were scattered with bright wild flowers. 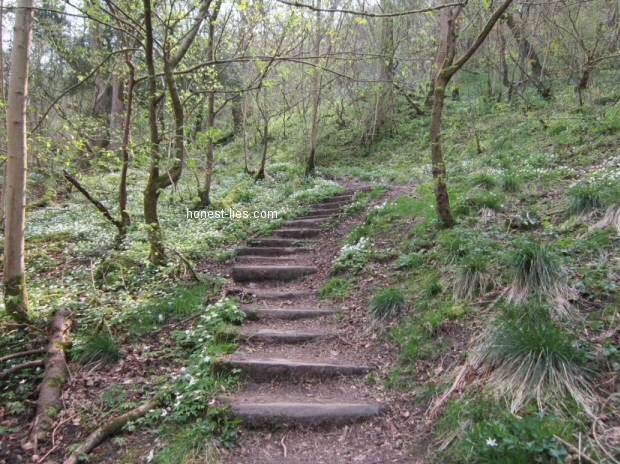 It was less polished there than the path leading up to Milldale, too. We hardly talked as we walked all this way, and I felt myself falling into a strange, but very welcome relaxed state, my mind unfocused, my thoughts meandering but never settling, not ruminating over bad things. We stopped to eat lunch at Fishpond Bank before we carried on our walk along the river. Eventually we realised we would have to turn back as it was already 2:00pm, even though we both were interested in carrying on and seeing how the scenery would change as we continued to follow the river. We backtracked to Ilam rock – at which point we changed directions, crossing the river and then taking a steep ascent on another path to Ilam – the path we were actually going to descend on, originally. We took this ascent very slowly- as it was relentlessly steep, and we were both tired. I had to stop quite often, to catch my breath. I felt hot and very thirsty for some reason, my mouth dry. 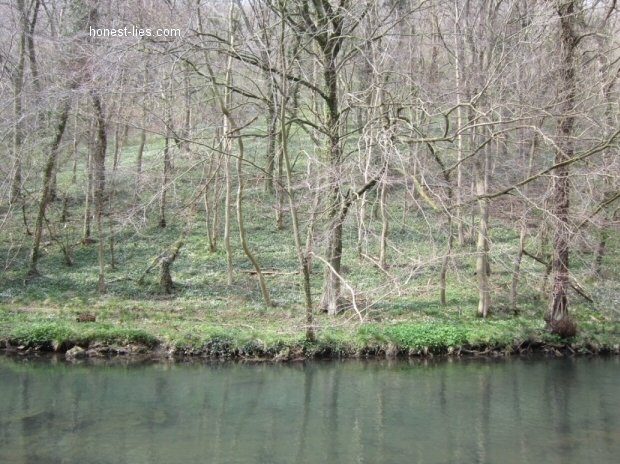 The surroundings were pretty though – forest and more wildflowers, bluebells in early bloom and others. We walked back to Bunster hill and then descended on the same path we had ascended – passing the sheep again. Out of nowhere one of the lambs started to follow me – trotting after me whilst making plaintive sounds. “Why is it doing this?” I cried to my dad, as I picked up the pace, trying to get away from this tiny little creature now running after me. Thankfully its mother picked up on what was going on and called it back. “You nearly took home something extra” my father remarked. Anyway, we made it back to Ilam, where I persuaded my father to buy us a cold snack – ice cream for him, an ice lolly for me. It was a welcome treat. The whole day had turned out to be perfectly clear and very sunny, with a cool breeze on the hills. A good day for walking, actually. I was glad that it had not rained in particular. We then went back to the car and my dad drove me to Uttoxeter station this time, only to find we’d missed the train we’d wanted by one minute. “At least we didn’t pull up as the train was pulling away,” I said. We went to a local retail park to a store and had a look at the plants, then ate supper at KFC. “All I’ve eaten today is pastries and this, really,” I said, a little dismayed “I guess walking 12 miles makes up for it?” We went back to the station and I got on the train. I felt a little wistful to be leaving my dad behind – a part of me wanted to go home, strangely. Actually, I really wanted to see my cat. It was cold by then, and I was thoroughly tired out. Once back, I got the bus, and then another bus because the 30 minute walk back from the bus station seemed too much, and then finally I was back at my house. It was a nice day – I was glad to get away for a bit. There’s something refreshing about taking a long, long walk. 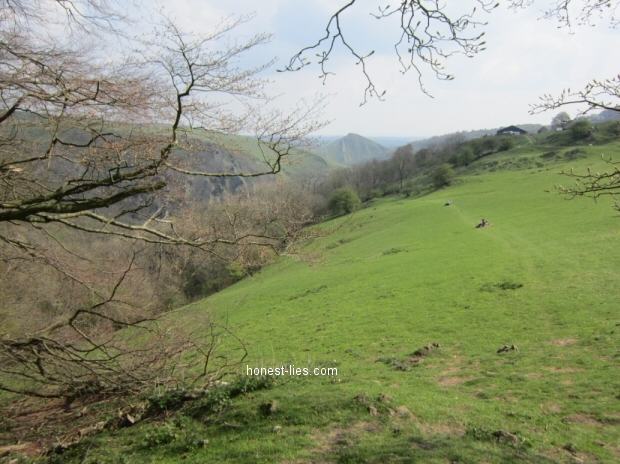 I can also see why Dovedale is one of the most popular sites in the Peak District. The walk is very friendly for all walkers – with nice paths, nice resting stops, even a little shop and toilets at Milldale. 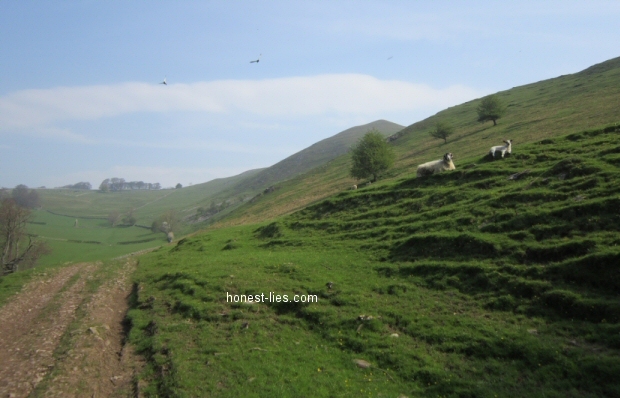 But you have all the beautiful scenery of the peak district alongside it – the river, the forests scattered with wildflowers, the caves and interesting rock formations, the impressive hills with some challenging enough ascents for those wanting a bit more from their walk. Very pleasant.